Have you ever noticed that little bottles of Tabasco Sauce are found in restaurants all over Thailand? The sauce fits right in with the Thai love of chilies. We’ve asked for, and received, Tabasco in a myriad of locations and the company says the sauce is distributed to 160 countries worldwide. Amazing since it’s development was accidental, and the pepper crops from which it is made are regularly exposed to the hurricanes that plague coastal Louisiana. 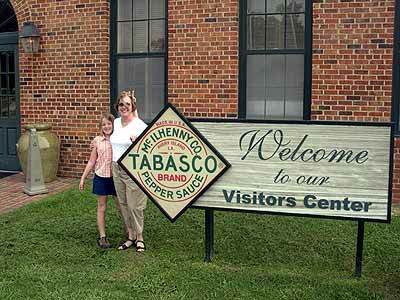 Visitors pose in front of the Tabasco factory. Sometime before the American Civil War, a soldier returning from Mexico gave a small gift of dried peppers to New Orleans banker Edmund McIlhenny. McIlhenny tried them on his food, liked the spicy taste, and saved the remaining pepper pods and their seeds. His wife’s family owned a salt-mining business on Avery Island west of New Orleans in the heart of Cajun country, so he planted the seeds in her garden there. A Chinese style pavilion houses an ancient Buddha image. The American Civil War forced the family to move from New Orleans to Avery Island, and in a round about way was responsible for the development of Tabasco Sauce into a worldwide enterprise. When Union troops invaded the island and took over the salt mine, the family fled to Texas. After the war, they returned to Avery Island but found their plantation ruined and their mansion devastated. The crop of capsicum frutescens, however, flourished. McIlhenny decided to turn the peppers into a family business, and mixed mashed ripe peppers with salt mined on the island and vinegar. Family legend has it that the first attempts were so bad that the sauce was sent to the cellar. It was discovered there three years later, and had developed into the delightful pepper sauce we use today. Whether that is true or not, we do know that the first pepper sauce was bottled in perfume bottles that were excavated from the ruins of the plantation. The formula, not the bottles, remains the same. Peppers are picked at the height of their ripeness, then chopped and mixed with a small amount of Avery Island salt the same day. The pickers use un petit baton rouge as a guide, a little red stick that is painted the exact shade of red as a perfectly ripened pepper. Then the mash is poured into used oak whiskey barrels, the lid is put on, and a thick layer of salt is applied to the top. As the mash ferments, bubbles of gas escape through the layer of salt along with a little of the liquid. The salt forms a hard, protective layer. The mash ages for three years, then is mixed with vinegar, stirred for about a month, strained and bottled. A member of the McIlhenny supervises every step of the way. 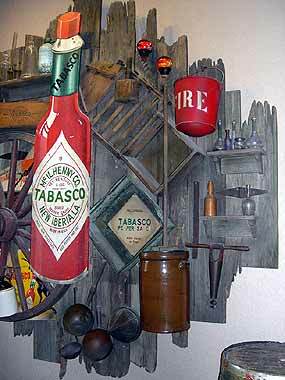 An assortment of old Tabasco bottles and implements used to stir the mash arranged on the factory wall. At one time, 700 acres on Avery Island were planted with the peppers but now only about 30 acres are cultivated there. The rest of the peppers are grown in Central and South America, where the year ‘round warm temperature allows continuous planting. The barrels full of mash are shipped to Avery Island for aging and the final mixing. If you go to Avery Island to tour the Tabasco factory, don’t forget that there are other attractions there. The island itself is the largest of five major salt domes located in coastal Louisiana. The massive rock salt dome was discovered on Avery Island in 1882 and quarrying began, the first in the U.S. The quarries are now leased to Cargill Salt. Two and a half million tons are mined annually with a purity of 98.9 percent. 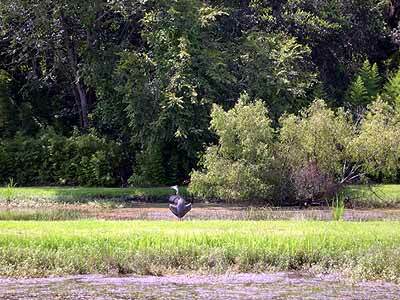 A great blue heron stretches its wings in preparation for flight, no doubt after spotting the alligator. 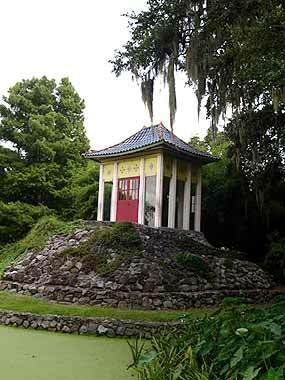 Avery Island is also home to The Jungle Gardens, the 200-acre tropical gardens and bird sanctuary created by Edmund McIlhenny’s son, Ned. Thousands of snowy egrets nest there in a protected environment each year. On the brink of extinction because their feathers were prized decorations for ladies’ hats when Ned captured seven young birds in 1892, the birds have come back strongly thanks to this sanctuary. On a hot summer day, our group also spotted great blue herons, a white-tailed deer and – oops! – alligators. Away from the water, and the alligators, you will be delighted to see a peaceful and beautiful Chinese Garden. A large Buddha image, circa 1125 was looted from a temple in China a hundred years ago by a Chinese rebel general and sent to New York for sale. It was purchased by friends of the McIlhennys and presides gracefully over the Chinese Garden. And don’t worry, www. hotsauceblog.com assures us that the McIlhenny Company is operating normally and the production of Tabasco products was unaffected by the recent hurricane. 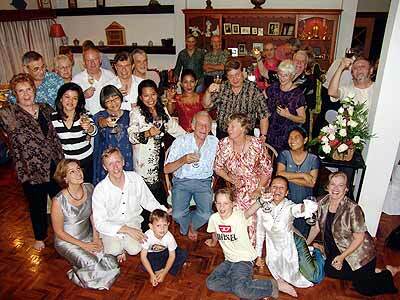 (Right) Well-wishers, family and friends personally congratulated Peter and Anne on their Ruby Anniversary. Forty years with one partner is certainly a long time in our fast-paced society. Nevertheless, Peter and Anne Dawson celebrated their 40th wedding anniversary last weekend, with a great number of family, friends and cricketing colleagues on this very special occasion. 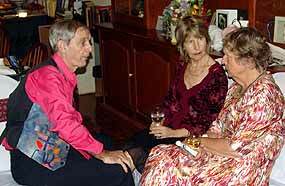 Anne personally took care of her guests, seen here happily chatting with the Crutchley’s. Peter and Anne, as active as ever, welcomed everyone personally, living examples of a couple who had the rare opportunity to grow a little older together without giving up their refreshing energy, enthusiasm for their hobbies, their gregariousness, yet also savoring their time alone together. However, being alone was not the idea that night, and party and enjoyment was the name of the game at the Dawson Residence. 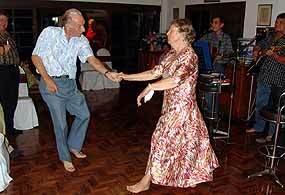 Just like on day one - Peter and Anne were the first on the dance floor, and the last to leave. Peter said that during the 40 years there were obviously ups and downs but it bonded them together, and he expressed that the last nine years here in Chiang Mai were amongst the most enjoyable. Both Peter and Anne were very grateful and appreciative that many members of their families made the effort to travel from Europe to join them on their special day. The evening was filled with fun, food, music, dance, and a never-ending supply of amber liquids, and everybody promised to join both of them in 10 years time for their Golden Anniversary! 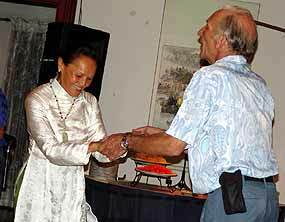 Peter took the time to compare the dancing skills of other ladies, here with Celeste Tolibas-Holland.